I am not a fan of people dressing up their pets in clothes (okay, except on Hallowe'en... or for an occasional soccer match...in their team kit -- that I am guilty of)... and I hate commercials & movies featuring live action animals that "talk" via so called animation "magic." It's a pet peeve of mine. A big one. So when I stumbled across this 2010 calendar, 'Pets Rock'... I had to slate it. Not funny, not cute....just dumb. It's not even executed very well. Would you want this mess tacked up on your wall? The Bowie monstrosity was one of the worst. 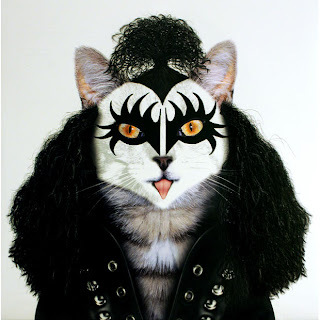 I couldn' stomach it up on the blog hence the KISS kitty.